Runners are a good thing — these long root-like tendrils that grow from strawberry plants actually create new plants. Wherever the runner touches soil, roots will form and a new plant will form. That means that once you have strawberries planted, you’ll never have to buy new ones again. The downside is that each mature strawberry plant will send out runners whether you need new plants or not. 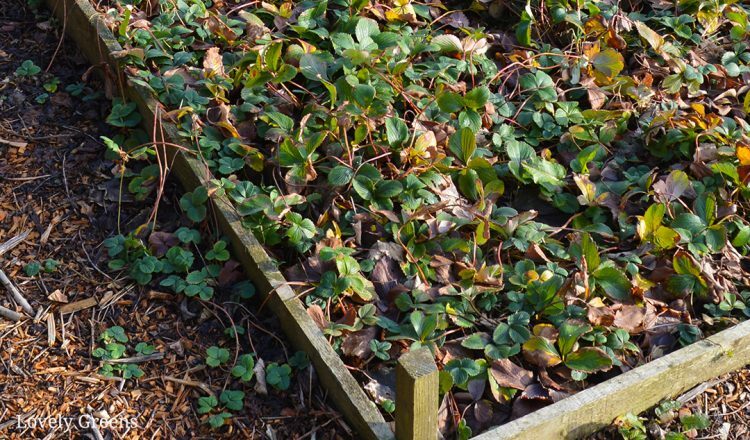 If the runners aren’t snipped back, baby plants can quickly crowd a strawberry bed. You can go from a tidy and productive patch to a matted mess in no time. 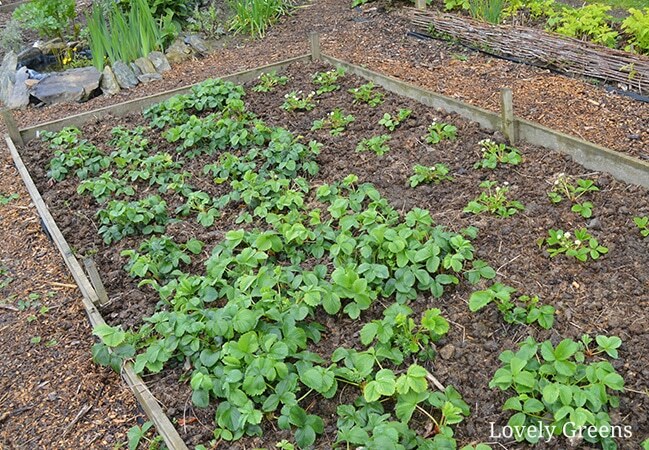 Traditionally, strawberries are planted in semi-permanent double rows 18-24″ wide called ‘Matted Beds’. Two-foot wide paths break up the rows so that you have a place to walk, weed, and pick berries. 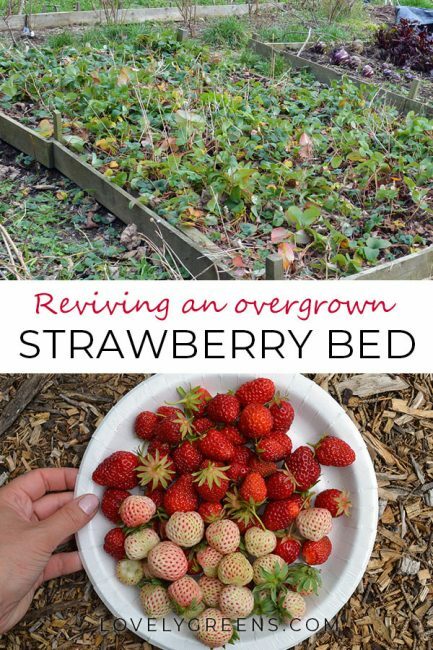 Strawberries can also be grown in smaller beds. My bed has three double rows of strawberries with a smaller 18″ area between them. I can reach most of my plants from outside the raised bed. You replace each strawberry plant with a new one every three years. This encourages productivity. 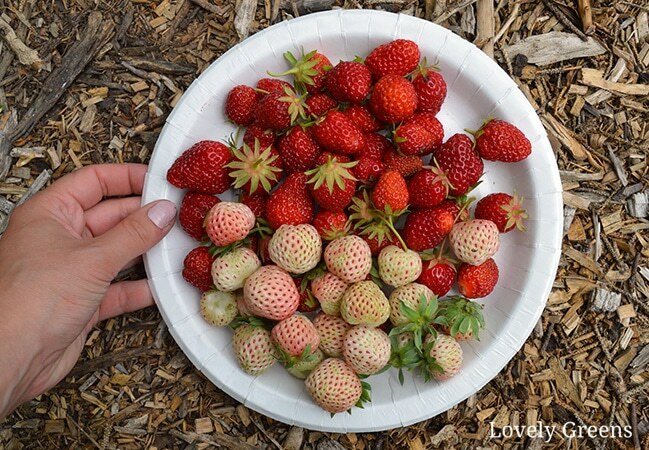 As far as location, strawberries like a slightly acidic and fertile soil. 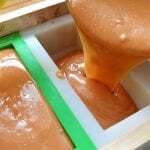 They also need at least eight hours of spring and summer sunshine per day to fruit. In rows, space each plant 18″ from the next. Also make sure that you don’t bury the crown or the plant may die. Mulch the plants by spreading straw or placing another material around the plants. 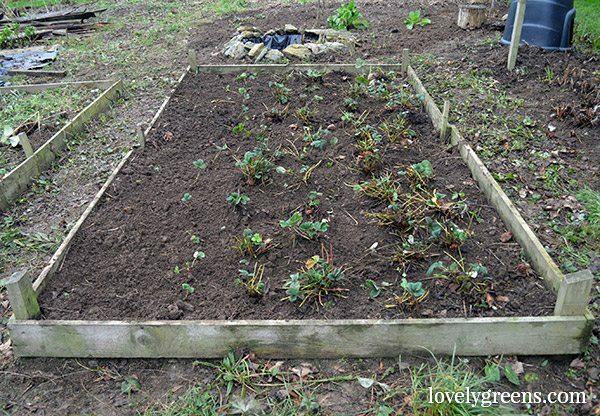 This will help reduce weeds, keep the berries off the ground, and also keep the soil moist. 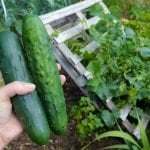 In summer, and after your plants have fruited, cut back all of your plants to two inches above the ground. 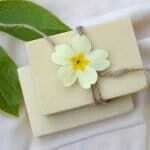 This encourages new leaves to form. If any runners have been sent out, trim all of them back too. Unless you want more plants of course. 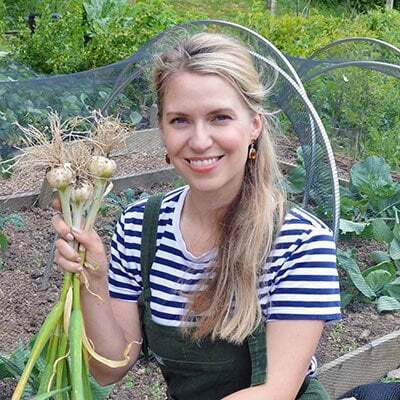 The plants will bounce back over the rest of the summer but they won’t produce berries again until the following year (unless they’re a a day-neutral or everbearing variety). If you’re diligent with cutting back runners you can control overcrowding. If you’re like me and sometimes forget, or go on vacation, or inherit a new garden, then you’re in for a fun time. 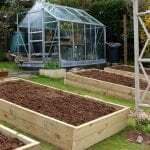 Although you could just leave an overgrown bed to do its thing, each plant will be far more productive if it has elbow room. When initially planting, you give each strawberry plant 12-18 inches in each direction as its own personal space. Providing that the situation is good, the space in between plants will quickly fill up with foliage, berries, and runners. Strawberries will happily send runners into pathways and baby plants will spring up in the most unlikely of places! 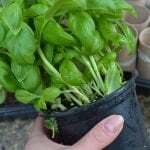 After the fruiting period is over — or in late winter/early spring — trim all the plants back to two inches in height. Trim any runners and unhealthy looking leaves off the parent plants. 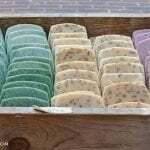 Remove any plants that have fruited for three years or more. It’s easier figuring this out if you plant an entire row at the same time. Replace removed plants with daughter plants formed from runners. If the new plant has formed roots, you can safely cut off the runner (umbilical cord) that attaches it to the parent plant. After a summer of growing, fruiting, sending out runners, and my six-week vacation at the end of summer my patch looked a lot different. Even though the plants were mulched with straw, the areas in between the plants were very crowded. A lot of the crowding was from the runners themselves rather than baby plants but it made the whole bed a crowded, tangled, mess. We have a very mild maritime climate on the Isle of Man so I feel confident about working with my plants in January. 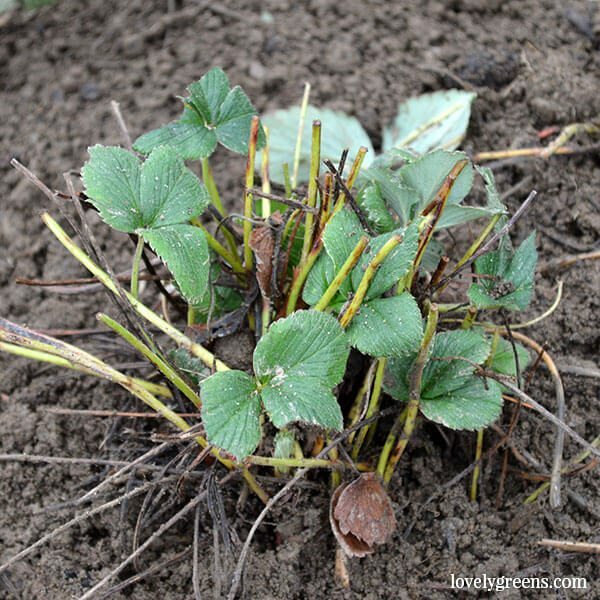 For those of you with more defined seasons, wait until early spring to tidy up an overgrown strawberry patch. It’s said that you can safely plant strawberry plants when night temperatures are no lower than 25F/-3.8C. I’d stick to that rule for tidying established plants too. After an hour of snipping, weeding, and replanting a row of strawberry plants. 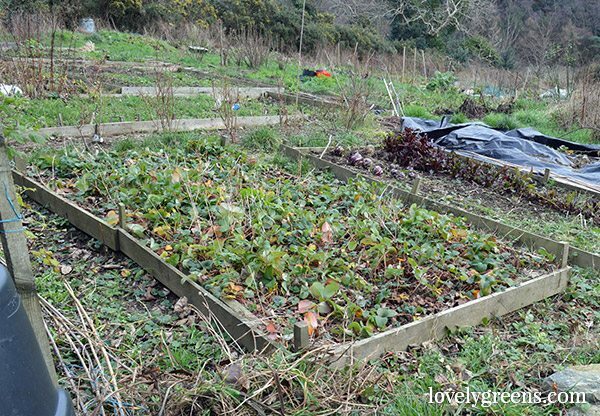 In my strawberry patch I’ve left two double-rows of older plants and moved some of of the stronger runners into their own new row. 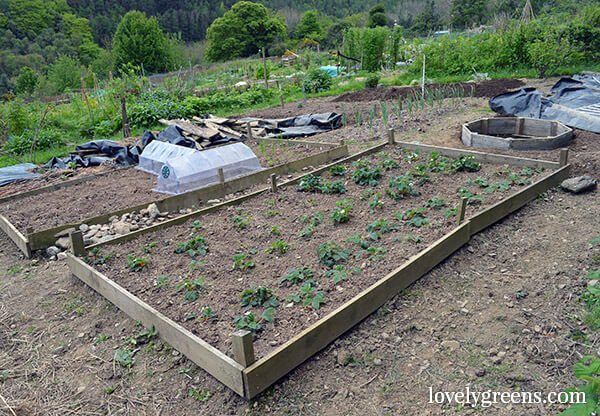 I’ll plant the last bit of soil up with bare-root strawberries that I’m ordering this year. Many of my plants are now the white Pineberry type and I’d like more red. When they’re all planted up and beginning to grow I’ll spread composted horse manure on top of the soil. On that will go a layer of straw, and when the fruits begin forming, a net will cover the whole bed. After all of that hard work we can’t have birds getting to the berries.